Encounter an entirely new and beautiful side of Kauai. Come with us to the Dark Side! BEGINNER to ADVANCED photographers are welcome! Hiking difficulty: easy to moderate. Individualized, hands-on instruction with an experienced professional photographer. Night adventuring creates a whole other realm of photographic possibilities! Unusual and spectacular locations on the island, seeking out what makes Kauai unique. Valuable knowledge relating to professional camera technology, conceptual critiques, digital post-production, workflow and on location shooting experience. Our night photography workshops are intense, fun, and highly educational. 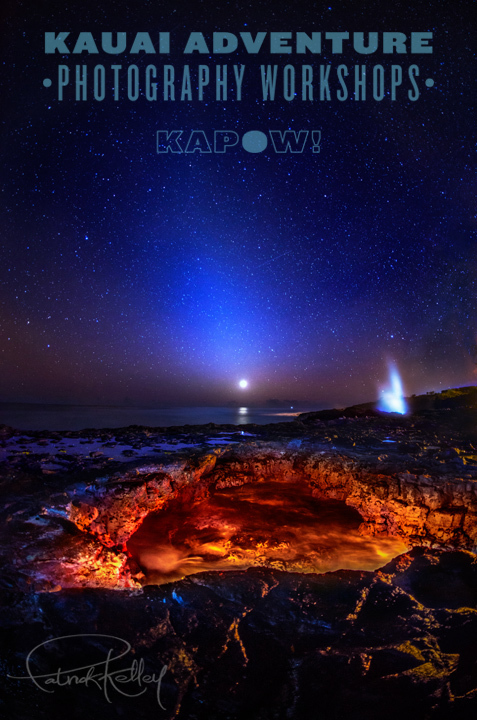 They are the best way to hone your night photography skills here in Kaua'i! This 3 hour workshop is designed to familiarize you with a variety of photographic techniques used while shooting at sunset and after dark. We are not like a photography tour. We will not rush you around from place to place. This workshop is for you if you want to capture the best images possible during your visit to Kauai. We will explore off-the-grid locations to find hidden or unique image possibilities. We will challenge you to push yourself and improve as a result. We make sure that our itinerary is flexible so we can adapt to changing lighting conditions to get the best images in the right place at the right time. These adventures are always unique and no two are ever the same! We specialize in fun and adventure, and we seize any photographic opportunities we may find. Our goal is not to limit ourselves to one type of shooting, but to teach the mindset of being able to photograph whatever you might come across in your travels with confidence and style. Check out the the workshop gallery to get an idea of what kinds of shooting we'll be doing along the way, and register for your workshop today! We'd love to take you from A to Z with your images. From capture to final processing and publishing! Book the Digital Post-Production Lightroom Workshop for after your shooting adventure for the full "KAPoW!" experience. Please click & review: payment refund terms and conditions. "We covered topics including simple composition, framing, special nighttime lighting, complimentary colors and how to best interpret the camera’s histogram for both light and color. Sign up now, it will be one of the best decisions you’ve made. I’ll be back!"